Thank you for your interest in attending SUNY Upstate Medical University's College of Medicine. 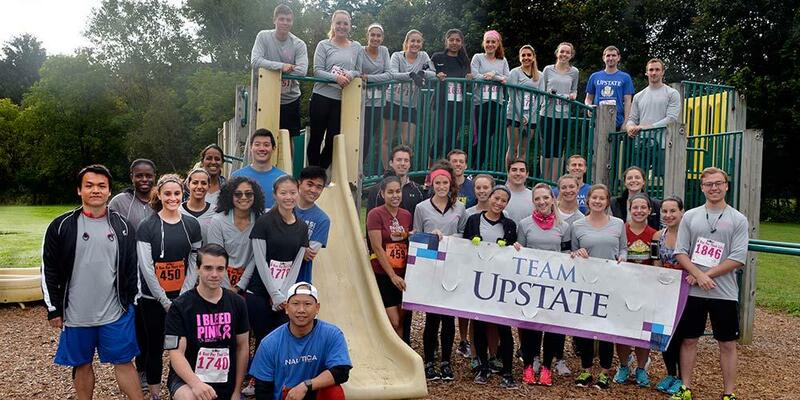 Each year approximately 160 students enter Upstate's College of Medicine from more than 75 colleges and universities. The College receives approximately 5,000 applications each year. The Class of 2016 has 43% women and 57% men. The average MCAT was 30.75 and the average cumulative GPA was 3.63. Upstate Medical University’s College of Medicine welcomes applications from U.S. citizens, permanent residents, foreign citizens, and individuals who are eligible for the Deferred Action for Childhood Arrival (DACA) process. Applicants must have at least 90 semester hours of course work in the United States or Canada at an accredited institution. SUNY Upstate Medical University requires background checks for all accepted College of Medicine students. More information on background checks may be found at the AAMC website. * While it is recommended, we do not require your Physics courses to be calculus-based unlike other medical schools. Applicants can apply without having completed all the pre-requisites however, if accepted, it would be on the condition that any outstanding required courses be successfully completed prior to enrolling. It is the responsibility of the applicant to make certain that all materials are received by our office prior to the appropriate deadlines. If an applicant decides to withdraw their application, we do require that they notify our office, in writing, as soon as possible. Last Modified: April 16, 2019. Contact Chris Liberty with questions about the content of this page.